Tumbling through the sky, and without deployment of its parachute system, the NASA Genesis capsule plowed into the Utah Test and Training Range at high speed last September. Onboard were prized particles of captured solar wind, entrapped within sets of fragile collectors. When the $264 million Genesis mission and its Sun-soaked cargo plummeted to the ground, the result was, as one scientist reported at the time, a "mangled mess" of a spacecraft. Later inspection of the breached specimen canister buoyed the hopes of project officials that valuable science could be salvaged from the shattered leftovers of sample trays. Some six months later, how the Genesis team is picking through the pieces and moving onward was detailed at the 36th Lunar and Planetary Science Conference (LPSC), held here March 14-18 and co-sponsored by the Lunar and Planetary Institute and NASA's Johnson Space Center. Among the on-site witnesses to the Genesis high-speed splat into Utah desert was Carlton Allen, the Astromaterials Curator at NASA's Johnson Space Center in Houston, Texas. "My immediate reaction was that our job had just increased by two or three years, but that the samples were still there," Allen said. "A 200 miles-per-hour crash isn't going to dislodge solar wind atoms that are buried in the collectors. It's going to take longer and people are going to have to work harder...but the samples are still there," he told SPACE.com. 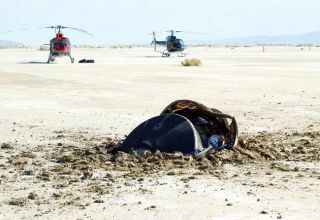 Getting to the solar wind samples, however, has not been easy as some of the collector fragments were contaminated by Utah dirt and lakebed salt crystals. Pulverized carbon-carbon heatshield material from Genesis was tossed into the mix too. Heat eking into the reentered canister didn't help the situation either. Also, silicon wafers onboard the craft turned into powder on impact, with the material was found sprinkled atop all the other samples. Then there's a still unexplained "brown stain" found within the science canister. The Genesis science team has made an effort to characterize the thickness and composition of the mystery tarnish. An early worry was that the stain's apparent thickness might prevent detection and measurement of the solar wind in Genesis collectors. The brown discoloration - pervasive but not uniform - isn't thick enough to have prevented the solar wind from implanting, reported NASA's Karen McNamara, working on the deconstruction of Genesis at the Johnson Space Center. "We have to look at the idea that something happened in space...outgassing or condensation of some type of material from the spacecraft," McNamara explained. When Genesis roared away from Earth in 2001, it carried 271 whole and 30 half hexagonally-shaped collectors mounted on 5 arrays. Those arrays were made of various materials, such as silicon, sapphire, gold and diamond-like carbon. The space probe flew to a point just under one million miles (1.5 million kilometers) from Earth. It then set out collectors for 850 days to "soak up the Sun" - snagging particles carried into space by a constantly streaming solar wind, then hauling the goods back to Earth. But smashing to Earth as they did, those Genesis collectors were crushed. Making the task even more onerous, very few collectors stayed affixed to their assigned array locations on impact. More than a month was spent in Utah bagging, tagging and classifying recovered shards as to size, identify, and found location. Luckily, the Sun-exposed arrays within the Genesis payload varied in thickness. That makes it feasible to trace back a fragment to its array of origin. All manner of fragment cleaning techniques are being weighed. That includes use of flowing inert gas, hydrogen plasma and ultra-pure water to utilizing cryogenic "snow" and defocused laser energy to remove contaminants. Great care is being taken not to cause scratching and removal of the solar wind implant. "We have 10,000 pieces that we've documented and an untold number of other pieces we haven't gotten to yet," said Judith Allton, Genesis Solar Wind Sample Curator at the Astromaterials Acquisition and Curation Office at the NASA Johnson Space Center. Although this type accident was part of contingency planning, and recovery teams trained for such an event, Allton admitted to a moment of sadness. After the Genesis canister was recovered at the Utah Test and Training Range, and as team members were getting ready to push it into a specially-installed cleanroom, "just looking at how bent up and mangled it was...that was sad," Allton recalled. We had worked so hard. And it was so beautiful when it left," Allton told SPACE.com. "I can remember when we closed it for the final time. People were thinking about how it would look when we opened it again. We cleaned it in minute detail. To see how it got mashed up...kinda sad," she said. Allton said the Genesis team was well prepared given what happened. Today, she and her colleagues are busy sifting through the bits and pieces, dealing with the contamination, a well as shipping out samples to research groups. It's not discouraging. It was always meant to be long-term. That's the way it works," Allton concluded. What didn't work was the recovery system onboard Genesis. Late last year a Mishap Investigation Board (MIB) looking into the Genesis crash identified a probable direct cause of the failure of Genesis' parachutes to open. The MIB reported that the problem likely centered on a design error that involved the incorrect orientation of gravity-switch devices. The g-switches were onboard to sense the braking caused by the Genesis capsule's high-speed entry into the atmosphere, and to then initiate a timing sequence that would have lead to deployment of the hardware's drogue parachute and parafoil. It was also noted by the MIB that "this single cause has not yet been fully confirmed, nor has it been determined whether it is the only problem within the Genesis system." Why this error happened, why it was not caught by the test program and an extensive set of in-process and after-the-fact reviews of the Genesis system was to be explored by the MIB. Lockheed Martin Space Systems of Denver, Colorado designed, built and operated the Genesis spacecraft. As of early this month, the MIB was wrapping up its reports for submission to NASA Headquarters in Washington, D.C. NASA will then begin an agency review process, but no word on when the reports would be available for public release. While scientists are busy teasing out the science from the Genesis puzzle palace, another set of samples is en route to Earth - also headed for a parachute landing at the Utah Test and Training Range. This time it is NASA's Stardust spacecraft. The probe is similar in many ways to Genesis and was also fabricated by Lockheed Martin Space Systems. Stardust has caught specimens of interstellar dust, as well as comet particles as it flew through the coma surrounding the nucleus of Comet Wild 2 early last year. The samples are to return to Earth on January 15, 2006, early in the morning local Utah time. After the Stardust return capsule fireballs its way through the nighttime sky over the coast between California and Oregon, there's no fancy in-the-air parafoil snaring of the canister by a Hollywood helicopter stunt crew. That was part of the Genesis recovery operations that was aced out when the canister augured in. A regular parachute is to deploy, slowing the Stardust capsule down as prelude to its terra firma touchdown. It will be picked up by a helicopter once on the ground. "We're in excellent shape," said Donald Brownlee, Stardust's principal investigator from the University of Washington in Seattle, well known for his discovery of cosmic particles in Earth's stratosphere known as Brownlee Particles. "We've done almost everything we have to do in the entire mission...only thing left is to come into the Earth." The Genesis crash did spark an intensive double-checking of the entry, descent and landing of Stardust, Brownlee pointed out. "We know that our g-switches are aligned correctly." "What was the chance someone would put a g-switch in backward and not be discovered," Brownlee noted. "It has got to be a low probability event." Brownlee said, however, that more attention is being paid to the possibility of "an anomalous landing" by Stardust's return capsule--meaning, if the parachute does not deploy. "Our capsule is half the size and one-fourth the mass of Genesis," Brownlee explained. Stardust has captured the dust and comet samples in aerogel - a silicon-based solid with a porous, sponge-like structure in which 99.8 percent of the volume is empty space. "Aerogel basically has almost no mass and can easily take hundreds of g's. I think that even if we had a hard landing without a parachute we would have a high probability of having aerogel survive in very good shape," Brownlee said. Brownlee added that the Stardust team expects all to go well. "The community is real jazzed about it. People all over the world, using all kinds of fantastic instruments and new techniques, are ready. We've got the best people signed up to do the analyses," Brownlee said. A message stemming from the Genesis crash has real impact on one future project--the robotic effort to return to Earth samples from Mars. Needless to say, hauling back into our biosphere possibly potent martian microorganisms has long been a much discussed bugaboo. Scientists and engineers have been working for decades on ways to avoid "back contamination" from Mars. "Certainly the lesson from the Genesis crash, which was apparently caused by parts incorrectly installed, is that you've got to be meticulous in your engineering," said NASA's Carlton Allen. "And that's certainly going to be the case for Mars. We are going to have to design any return spacecraft from Mars so that it can handle a hard landing, such as we saw for Genesis," he added. Allen said that any returning capsule chock full of Mars soil and rock will not be designed in such a way that it will split apart if the parachutes don't work. "It just can't work that way," he concluded.